Cancer is caused by cells in the body reproducing uncontrollably, according to the NHS. The cancerous cells can invade and destroy the surrounding tissues, including healthy cells and organs. More than a third of people will develop some kind of cancer at some point in their lifetime. 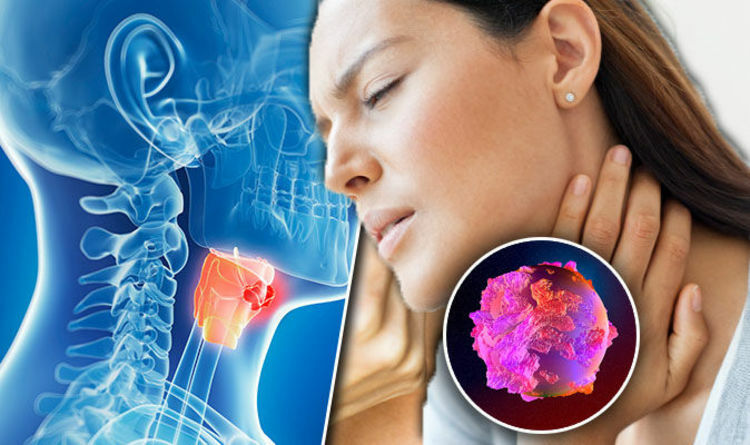 A sore throat could be a warning sign of throat cancer, it’s been claimed. Sore throats are very common, and are usually nothing to worry about, said the NHS. They normally get better by themselves within a week. But, the condition could also be a sign of cancer. So how can you tell the difference? The throat cancer symptom could last for weeks on end, whereas the flu sign usually gets better by itself. If you have a sore throat for more than three weeks, you should speak to a GP, said the NHS. “Throat cancers grow in the organs that help you swallow, speak, and breathe,” added medical website WebMD. “You may have voice changes like cracking or hoarseness, trouble swallowing or breathing, or sore throat, cough, or earache that won’t go away. Throat cancer symptoms also include a persistent headache, finding a lump on the neck, or unexplained weight loss. Smoking, drinking alcohol and a diet without enough fruit and vegetables are the main risk factors for the disease. There’s no specific way to prevent the cancer, but drinking in moderation and quitting smoking, if you’re a smoker, will lower your risk. If you have a sore throat, you could treat the condition by gargling warm, salty water, said the NHS. Avoid drinking hot beverages, and eat cool, soft foods. Sore throats are often caused by viruses – the cold or flu viruses – or from smoking. Speak to a GP if you often get sore throats, or if you have a sore throat and a very high fever. But, you should dial 999 and ask for an ambulance if you have a sore throat, and you’re making a high-pitched sound as you breathe. It could be a sign of something more serious.